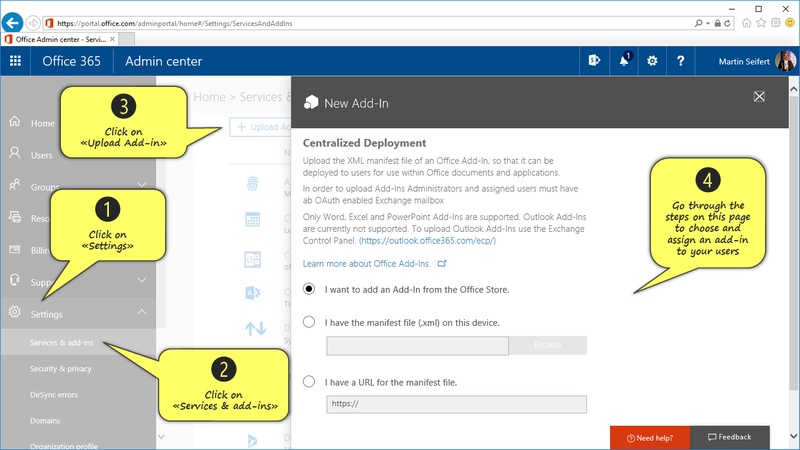 Learn more about how to deploy modern Web Office Add-ins within your organization using the powerful Office 365 Centralized Deployment feature. Modern Web Office Add-ins like all of the officeatwork 365 Add-ins for Office can be deployed to your users using the Office 365 Centralized Deployment feature. This feature will allow you to deploy add-ins to your users on all devices and platforms. There are no local installations necessary for this to work. Check out the videos below to learn more about centralized deploying Web Office Add-Ins in Office 365. Check out the screenshot below to see the basic steps required to centrally deploy modern Web Office Add-ins. Please note: You must be an Office 365 admin to be able to sign into the Office 365 Admin portal. We recommend to use the ‘I want to add an Add-In from the Office Store‘ option as this will keep your add-ins up-to-date automatically! Modern Web Office Add-ins can also be deployed for Office 2013. For that you can use the SharePoint Add-In catalog deployment method. Please note that some features like showing icons in the ribbon in Office will not be available via this deployment path. This deployment method will though work for the officeatwork 365 Template Chooser and Content Chooser Add-Ins. Please expect limited functionality due to missing API's in Office 2013. Here are some links to important Microsoft documentation pages regarding deployment of modern Web Office Add-ins.